Juan Carlos, a member of the Salem Church, met Nicolas Hernandez at work. Nicolas was invited to church and he began to attend regularly. Soon after, in a church service, he walked forward when an invitation was given to accept Christ as Savior. During worship time he would share about how he was witnessing to his family in Vera Cruz, Mexico. He matured very quickly in his Christian life. With his guitar he helped with the Spanish singing during the Sunday school classes. 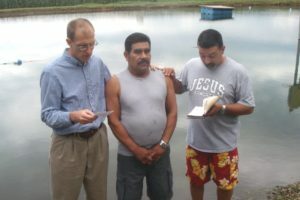 Soon he informed pastor Haroldo Nunes that he wanted to be baptized. During the morning service July 28, 2013, by the Fountain Center lake, after sharing his testimony and singing a hymn that he had written, he was baptized by pastors Haroldo Nunes and Tim Singenstreu.